Ptolemy VI Philometor was the sixth ruler of the Ptolemaic Dynasty. He was born the son and of Ptolemy V Epiphanes and his Syrian wife Cleopatra I. Like his father, Ptolemy VI came to the throne at the age of only 5 following his father’s death, which was rumored to have been murdered. Cleopatra I died at approximately four years after Ptolemy VI took possession of the throne when he was still but only 9 years old in 176 BC. 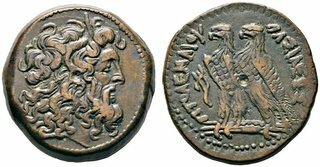 Hence, Ptolemy VI came under the control of his guardians, Eulaeus and Lenaeus who proved to be incompetent and even provoked a conflict with Antiochos IV of Syria. Ptolemy VI was married to his sister Cleopatra II by whom he had a son (future Ptolemy VII) and two daughters. He was forced to share the throne with his younger brother Ptolemy VIII Euergetes II Physcon. In 164 BC, Ptolemy VI left Alexandria and traveled to Rome where he pretended to be a working-class citizen. Ptolemy VI waited in Rome until the authorities came to him. Meanwhile, Ptolemy VIII Physcon ruled in Egypt during his brother’s absence. Ptolemy VII Physcon was a very unpopular ruler. The Alexandrians soon were pleaded for Ptolemy VI to return from Rome to rule in Alexandria. In May of 163 BC, the two brothers finally agreed to divide the Empire with Ptolemy VIII retaining the western province of Cyrenaica and Ptolemy VI becoming sole ruler in Egypt. In 145 BC, Ptolemy VI died in battle defending his country against the Syrian invasion led by Alexander Balas. He was succeeded by his son, Ptolemy VII. However, Ptolemy VIII, upon learning of his brother’s death, invaded Egypt and forced his young nephew to share the throne. One year later, Ptolemy VII was murdered by his uncle.